Granada has plenty of lovely, boutique hotels so how do you make a choice? My suggestion is by location. The areas that most people want to see are along the River Darro, Sacromonte and the Albaicin. The Alhambra, of course, will be on your to do list but the hotel, so you can enjoy the best of old Granada, should be on or near the river. Here are four lovely, boutique hotels in prime locations so you can step out of your door and begin to explore the delights of Granada city. Next to a tiny plaza on the edge of the Realejo district, Granada’s Jewish quarter it’s a great location for exploring on foot. Five minutes from the shopping area, the River Darro and the cathedral. A charming hotel with a beautiful wooden, inner patio with its own ‘wishing tree’ and flowing fountain. The 16th century house was a pilgrim’s hostel in the 17th century. The fifteen rooms are all unique and decorated with ‘literary or musical’ themes. The best room in the house and the only one with an Alhambra view is Leyenda de la Rosa de la Alhambra in the turret. In the Realejo district this 16th Casa Palacio, house/palace has an imposing stone surround door leading into a typical patio with original wooden beams, shiny marble pillars and that ever-present Moorish feature – a tinkling fountain, which on hot summer days you will appreciate. Choose the high-ceilinged Deluxe Double at the top as it’s the best room of the house. This 16th century mansion is right on the River Darro with the Albaicin climbing behind. Choose a front room and you’ll have stunning views of The Alhambra’s Nazari Palace and Alcazaba on the hillside across the river. Ideal for the Hammam Baths, a short walk to the cathedral and in the most sought-after part of the city. Its twelve rooms are all pale chic with splashes of colour and glitter around. Go for the best and ask for the Superior room 103 with two cute balconies for those fabulous views. Located in the lovely Albaicin district of steep Moorish streets, tiny plazas and gorgeous old buildings Hotel Casa Morisca is in one of the best spots. Only ten minutes walk from the cathedral and a short hop, although uphill, from the gypsy caves of Sacromente. The fourteen-room Hotel is a 15th century townhouse which has been stunningly transformed into a Moorish style Boutique Hotel. Complete with a typical Andalusian interior patio with pool, gurgling fountain, a well and beautiful floor tiles. Check out hotels in the best areas in Granada on Booking dot com. 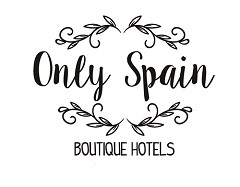 See my Spanish boutique hotel collection – OnlySpain. If you want to visit the Alhambra with a guide or fancy a walking route around the Albaicin, seeing a Flamenco show in Sacromonte or a photographers tour of Granada look at Visitfy.com if you book a tour and use the discount code – SPANIOLA you will get a 10% discount off many of the tours and I will get a small commision for introducing you.